(ZIZ)– Principals and teachers of secondary schools started the first day of the Easter break engrossed in a retreat of the Junior Achievement Company Programme. The retreat was held at the Chamber of Industry and Commerce. The Junior Achievement Programme, which is launched in all secondary schools across the federation, seeks to mould high school students for future success. 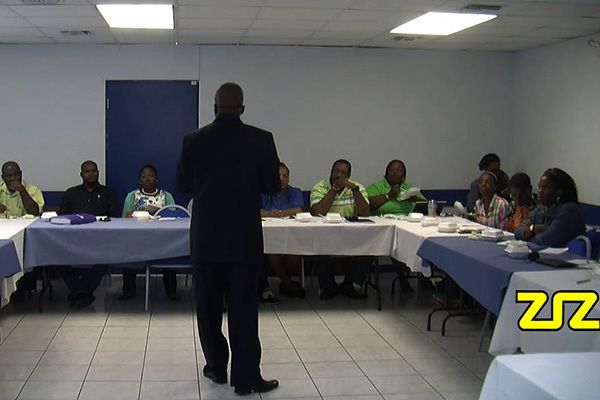 Tracy Herbert, Executive Director of the Junior Achievement Programme in St. Kitts and Nevis, says the purpose of the retreat is to strategise to ensure that the programme is continued. Guest Presenter at the Retreat, J. Errol Lewis, who is also the Executive Chairman of the Junior Achievement of Trinidad and Tobago, commended the principals and teachers for showing interest in the development of the federation’s students. He also spoke of the importance of the Junior Achievement Programme. “It is very important, now more than ever, that we tool our young people to face the future. We are into the education process and I think junior achievement is tailor-made for preparing students for citizenship, workforce readiness and to provide financial literacy so that in fact we will bring a system to the table that the teachers can now use to help them to do what they have to do, which is educating young people,” Lewis explained. In his address, Lewis encouraged the principals and teachers to be well prepared and organized to deal with the students who are dependent on them.